solid construction. attractive, just right for 2 people. also very comfortable. needs to be tighted once a year. 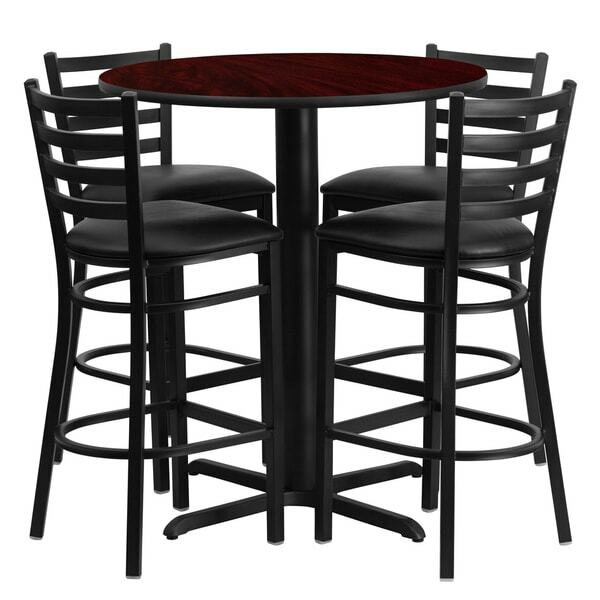 No need to buy in pieces, this complete bar height table and stool set will save you time and money. This set includes an elegant mahogany laminate table top, X-base and four (4) metal ladder back bar stools. Use this setup in bars, banquet halls, restaurants, break room/ cafeteria settings or any other social gathering. Mix in bar height tables with standard height tables for a more varied seating selection. This commercial grade table set will last for years to come with its heavy-duty construction. This pub set was the missing link for my mancave. Great addition to the house. Football games and gatherings will never be the same. Thanks Overstock. Purchased 3 complete sets for the executive break room. Love the deep color tones and the height of the tables. I would recommend this set, sturdy, easy to clean and they look wonderful. Well worth the purchase. Assembly required is one thing, having to drill all of the holes is another. I would not have ordered this set had I known. The product is too high-priced when this much work has to go into it. The hardware to attach the seat cushions to the chairs was not included, so I just contacted customer service about that and am waiting to hear back. I regret this purchase. The table and chairs are great ordered a total of five sets. 1 alone and then 4 more together. Shipping on the second set of 4 was not stellar. Company showed up without a a lift gate and had to have VFW patrons help unload. Very nice looking and functional. Like the top. Bought it for my daughter's apartment. "Does anyone know how tall the table and chairs are? I cant find it in the description..."
"I'm trying to determine how substantial the table and chairs are. I see there are glides on the table legs. Are they adjustable for height balancing and what about the chair legs? I'm looking for 3 sets but will probably order 1 set first to make sure they will work for us. What is your return policy? Can you tell me how many are currently in stock?." The table and chairs are not height adjustable. According to our system, we have more than enough in stock (50+). Items must be returned in new or unused condition with all the materials included with the shipment. For more information on our return policy, please click on the shipping and returns tab. Loved the look of it. Will fit nicely in an apartment dining area. "Is it possible to just purchase the table without the chairs?" Hello overstock, we do apologize, this table is not currently offered separately.Thank you for shopping with us.